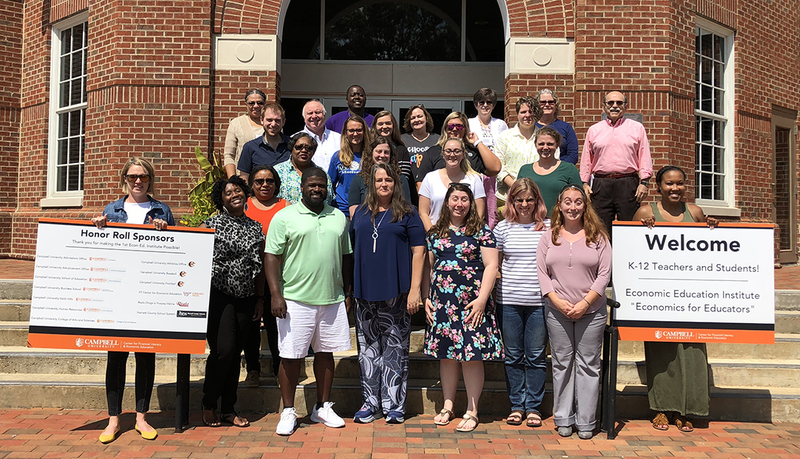 Campbell Business recently hosted its first-ever free summer economics institute for educators, Aug. 6-10, and the positive response has been overwhelming. The event was open to current K-12 teachers, as well education majors currently enrolled in an undergraduate program. Grounded in research-based, economics instructional practices, the hands-on five day professional development program equipped K-12 teachers with the economics content knowledge and pedagogical best practices needed to effectively teach economics in an accessible and empowering way. Teachers learned how to translate economics content into life skills required of critically-minded, reflective individuals who make intelligent and productive decision as democratic citizens and participants in a global economy. Topics included microeconomics, macroeconomics, and international economics. Instructors put to use field-tested, active-learning lessons relevant to students’ lives that can be easily applied in the classroom. “The K-12 teachers who attended the economics institute deserve a standing ovation for giving up a whole week of their summer vacation to learn a semester’s worth of micro, macro, and international economics content and pedagogy,” said Cheryl Ayers, Ph.D., the co-director for the Center of Economic Education at Virginia Tech. “Many of the teachers had never taken an economics course before despite being required to teach economics, so it was especially rewarding to see them understand how economics empowers all students to make informed and productive decisions as democratic citizens and participants in a global economy. Attending teachers received a wealth of student-centered instructional resources for teaching economics, include a Virtual Economics 4.5 flash drive ($160 value) that contains more than 1,400 K-12 activity-based lessons on economics, personal finance, and entrepreneurship. Participants also picked up a certificate of completion for 40 hours of professional development at the completion of the institute. “I am leaving this course with knowledge and resources I never dreamed imaginable in just a week,” said one teacher. “I was nervous about attending as a first-year teacher, but the program was so inclusive and beneficial,” said another. “This course is amazing! It is what North Carolina needs throughout our school system. I would like to see this class being offered more often,” said a third teacher. In addition to Campbell Business, the institute was co-sponsored by the Campbell University College of Arts & Sciences and the Campbell University School of Education, made possible by the Center for Financial Literacy & Economic Education and the Harnett County School System, and in partnership with the Virginia Tech Center for Economic Education.